Fostoria calls itself the "Iron Triangle" due to the three mainlines that pass through town creating the shape of a triangle. 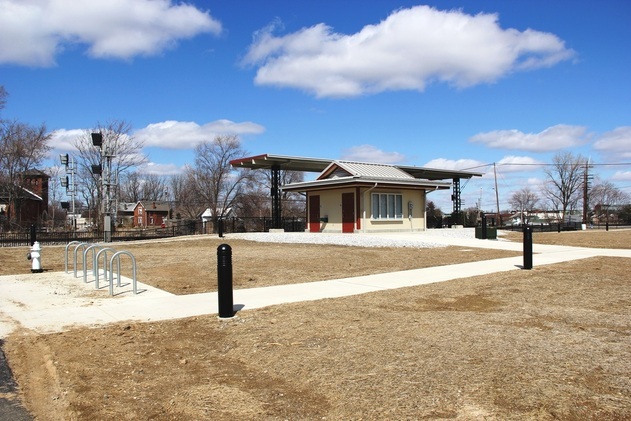 In the center of the triangle, the town purchased the land, removed the excising building and built one of the largest train-watching parks in the nation. A good 80+ trains pass through Fostoria on a daily bases. The railfanning hobby has become one of Fostoria’s top tourist attractions. People from all over the world makes this pretty much isolated town their destination, or at least an important part of their trip. The railroads include Norfolk Southern (former Nickel Plate main), CSX (former Baltimore & Ohio mainline), and CSX (former Chesapeake & Ohio, Toledo Line). The park is open 24/7 for train watching. Railroad(s): CSX Transportation (2 lines, B&O main, and C&O Toledo Line). Norfolk Southern Railway. Rail Traffic: Expect 80 trains through town every 24-hours. Due to the "triangle", trains usually only move on one line at a time. stray too far off the street just in case. If you’re a new visitor to Fostoria, I strongly recommend watching the trains from the park only. You can see all three rail lines, and you’re in a safe and legal spot. Fostoria is a busy and complex rail scene. A few small yards, several interlocking’s and several large customers create a busy area for rail traffic, but its easy to end up trespassing on both railroad and private property. The railroads guard their property and don't tolerate trespassing. Restrooms on site: YES, heated. Food: Pop & snack machines on-site. A 5-minute drive can land you on North Countyline Street (US-23) where several sit-down restaurants, fast food places and mini-marts are located. Parking: Free parking in a large lot for autos, Buses, RV's. Lighted for nighttime railfanning. Lighted for evening railfanning: YES, the parking lot of the railfan park is lit and the park is open for visitors 24-hours a day. The only drawback is the parking lot lights are the new LED's (they light in a direct path), there is no "light noise", which means seeing trains at night is still difficult if you’re interested to videoing trains past the park at night. Scanner Frequencies: / CSX Willard Sub: 161.520 / CSX Columbus Sub: 160.320 / CSX Pemberville Sub: 160.635 / CSX Yard 161.160 / NS Fostoria District: 160.250 / NS Yard: 160.950 / NS Mixing Center: 161.490. Motels / Hotels: The Best Western motel about 10-minutes up US-23 is the best kept motel in town, and its run by a ......you guessed it, a railfan! You can buy railroad related Iron Triangle souvenirs there, plus there is a photo album in the lobby of the trains of Fostoria! They also have a Railfan Sign-In log book! The Norfolk Southern line is lit well for great photographs most of the day. Here a westbound NS train passes the covered deck of the railfan platform. This view looks east down the Norfolk Southern Railway former Nickle Plate Road. A southbound CSX train is about to pass F Tower (seen just ahead of the train). The park is completely protected by the iron fence seen in this photo. The C&O line is best sun lit in the afternoon hours. Cloudy days, such as the day I shot this photo - do not draw any shadows. site years before any thought of a train-viewing parks was built]. BNSF locomotives on CSX trains is a common sight on this line. A westbound Canadian Pacific run-though train is on the CSX-B&O mainline. There are a couple of these trains each day. This is about the best photo angle you can achieve on westbound trains traveling on the B&O line. By spending a day in Fostoria, you should be able to see locomotives from all major North American railroads, plus other surprises! The main area of the park consists of this building that houses the parks restrooms. The high awing is also pictured. The photo faces the Norfolk Southern Railway. The signals pictured are a few of the signals fans can view from inside the park. A green or yellow aspect can let you know a train is lined up to cross one of the several diamonds in town. The bicycle rack is a nice touch, although I can't see this actually being used; hopefully the same will go for the fire hydrant! A former B&O caboose is now displayed in this open area, an addition that was added to the park in 2017. A photo taken from the parks only train-watching deck, an eastbound Norfolk Southern train races east past the signals that protect the C&O line. CSX train dispatcher controls the entire triangle, including this portion of the NS line. When long NS trains pass through town, through traffic on the B&O and C&O stop. It’s not uncommon to have NS trains bunched up on each side of town. When one NS train moves, always expect another on the opposite track. Same holds true for the B&O mainline. One unique feature of this park is you can watch the trains "Go around the Christmnas tree", so to speak! Here a Auto-Max trains moves from the B&O to the C&O rounding the southeast corner of the park. This photo was taken several months after the parked opened, this area will soon be a grassy field. the B&O as its about to head west to Chicago for interchange to the BNSF Railway. Afternoon south bounds on the C&O line offer great photo opportunities from the park. Being in the wrong place at the wrong time. I'm speaking about myself, not the train. Too often during my visits, I find myself on the wrong side of the park to achive good photos / videos of passing trains. Moments ago a NS train just cleared the triangle, seconds later a westbound CSX train on the B&O passes the park. There was no way to run to the other side of the park in time. This westbound double stack train is seen from the parks parking lot. While standing in the long driveway of the park, a eastbound Norfolk Southern train with Union Pacific and BNSF power is seen across a grassy field. This section of grass is fenced off, I'm not sure if its part of the park. The view looks directly north. not always possible. Since there are tracks on all three sides of the park, a radio scanner or ATCS comes in handy while railfanning Fostoria. Got Roster Pictures? No shortage of roster shots from the park, locomotives, freight car shots are no problem from any part of the park. These two units were slowly passing while going to pick up a loaded grain train just west of town.